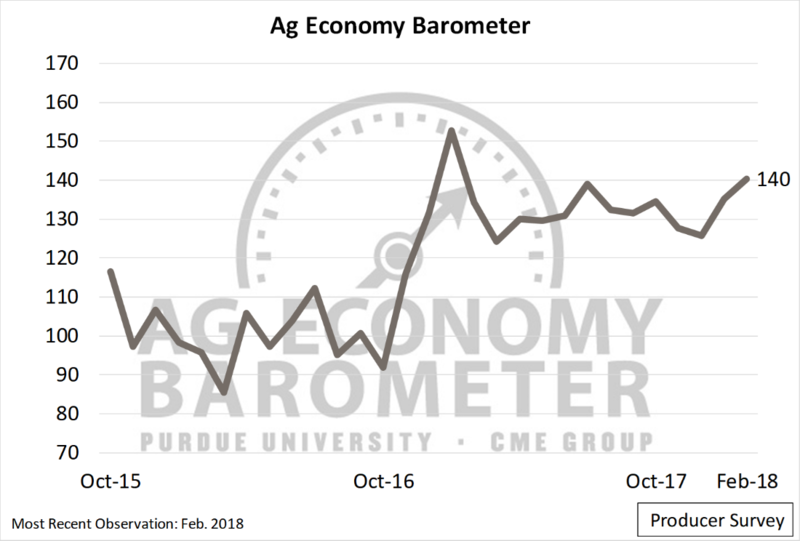 The Purdue/CME Group Ag Economy Barometer moved higher again in February. At 140 points, producer sentiment, which is based on monthly survey of 400 agricultural producers from across the country, reached its second-highest level in more than two years of data collection. Sentiment is also higher for the second-consecutive month, providing a strong 14-point boost to the index compared to December 2017. Figure 1. Purdue/CME Group Ag Economy Barometer, October 2015-February 2018. While the Ag Economy Barometer reached a survey high of more than 150 points back in January 2017, it’s worth noting the difference between the January 2017 peak in sentiment and the February 2018 reading (Figure 2). In early 2017, favorable sentiment regarding the agricultural economy was most heavily influenced by a strong uptick in in the forward-looking measure of producer sentiment, the Index of Future Expectations, along with a more modest improvement in current conditions (Figure 2). More recently, however, the barometer has been strongly supported by a long-term improvement in producer sentiment regarding current conditions on their farms, along with an uptick in expectations for the future. So, a year ago the primary driver behind the barometer’s rise was better expectations for the future, whereas this year the primary driver appears to be an ongoing improvement in current conditions. Figure 2. Index of Current Conditions and Index of Future Expectations, October 2015-February 2018. On the February survey, producers were asked about their future expectations for U.S. agricultural exports. Agricultural producers remain optimistic that U.S. ag exports will remain strong over the next five years with 87 percent of respondents expecting exports to either remain about the same or increase. Just 13 percent of farmers in the survey expressed concern that U.S. ag exports will decline over the next five years, which was virtually unchanged from a year ago when the same question was posed to producers. The upshot is U.S. agricultural producers’ long-run expectations regarding agricultural exports have not changed over the course of the last year. A new survey question regarding the likelihood of the U.S. withdrawing from the North American Free Trade Agreement (NAFTA) agreement was posed on the February 2018 survey. 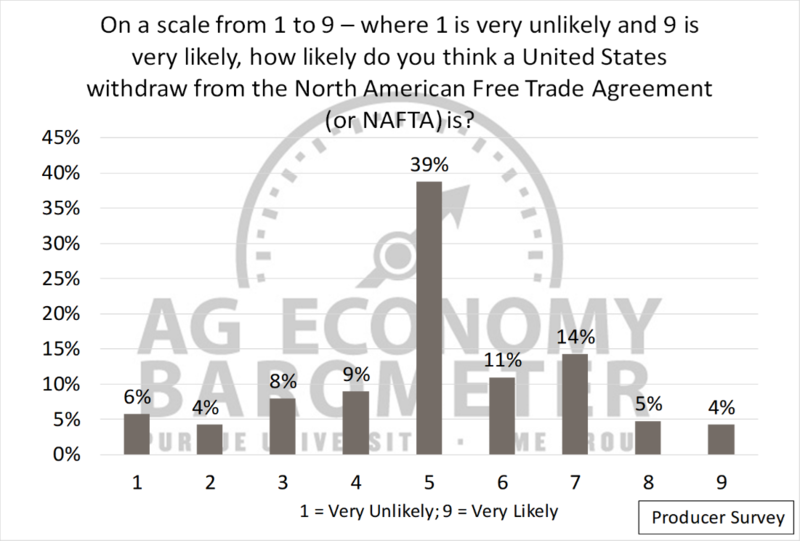 Producers were asked to rank, on a scale from 1 to 9, the likelihood of a U.S. withdrawal from NAFTA (Figure 3). A large portion of respondents, 39 percent, provided a neutral rating of 5, while 34 percent indicated they thought withdrawal was more likely (a rating of 6 or higher) and 29 percent thought a withdrawal unlikely (a rating of 4 or lower). Responses suggest there is a tremendous amount of uncertainty among producers regarding the future of NAFTA. Despite that uncertainty, and notwithstanding the importance of U.S. ag exports to both Mexico and Canada, producers remain relatively optimistic about long-run prospects for U.S. ag exports. Figure 3. Rating of the likelihood the U.S. withdraws from the North American Free Trade Agreement (NAFTA), February 2018. Many corn and soybean producers were in the midst of finalizing 2018 cropping plans when the February survey was conducted. With that thought in mind, producers were asked about their expectations for corn and soybean production in 2018. 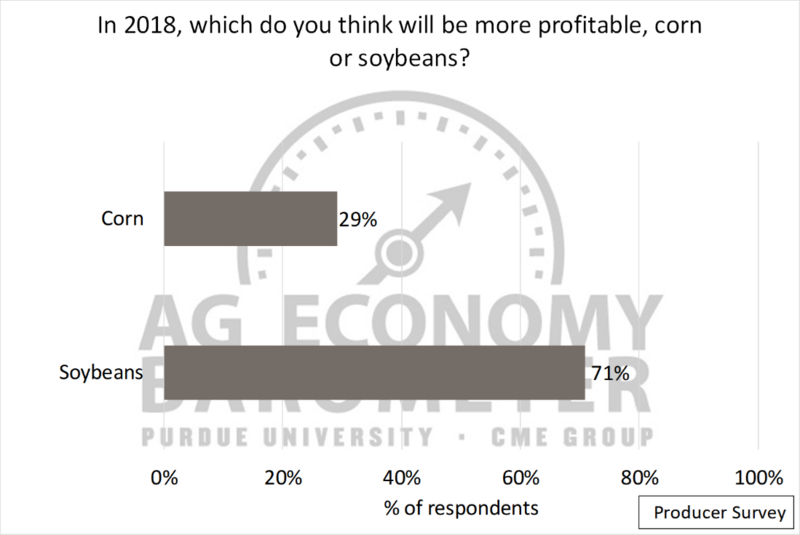 When asked which crop they thought would be more profitable in 2018 – corn or soybeans – a majority (71 percent) reported soybeans (Figure 4). This is a modest shift from the February 2017 survey when 67 percent of respondents expected soybeans to be more profitable than corn. To learn more about producers 2018 cropping plans, producers were asked if they will plant more, fewer, or about the same number of soybeans acres in 2018 compared to 2017. The vast majority of respondents (81 percent) expect their 2018 soybean acreage to be unchanged from 2017, with nearly equal shares of producers expecting to plant more soybeans (10 percent) as those planning on planting fewer (9 percent) soybean acres. This was a shift from responses received when this question was posed on the February 2017 survey. A year ago, looking ahead to the 2017 planting season, 18 percent of producers reported they planned to increase soybean acreage, whereas 8 percent of respondents planned to reduce their soybean acreage. In other words, compared to last year’s survey responses, a slightly larger share of producers expect soybeans to be more profitable than corn, but fewer producers report plans to increase their soybean acres. Interestingly, at the Ag Outlook Forum held in February, USDA projected that U.S. farmers will plant 90 million acres of soybeans, virtually unchanged from 2017. USDA’s Prospective Plantings report, which provides a survey-based estimate of farmers’ 2018 planting intentions, will be released on March 29, 2018. Figure 4. Expectations of which crop, corn or soybeans, will be more profitable in 2018, February 2018. Agricultural producer sentiment increased again during February to the second-highest level since data collection began in October 2015. 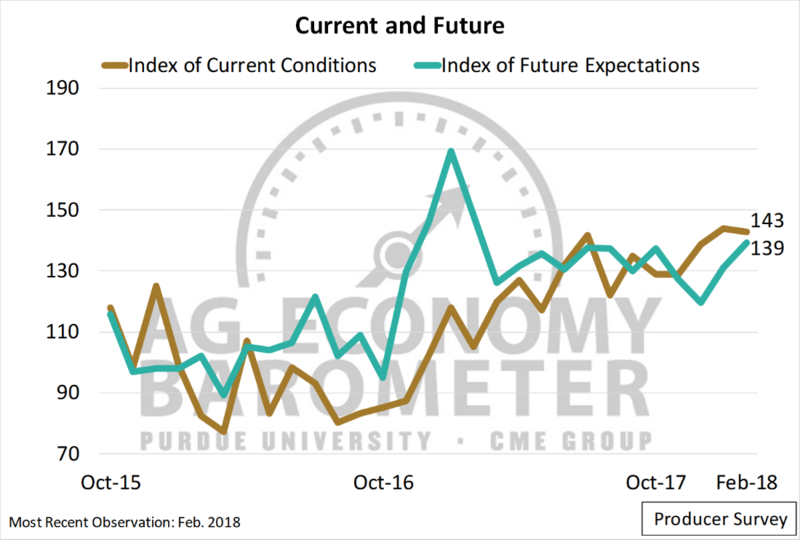 Both the Index of Current Conditions and the Index of Future Expectations rose during February compared to a month earlier, but the long-term improvement in the Index of Current Conditions dating back summer 2016 is providing strong underlying support to the overall measure of producer sentiment, the Ag Economy Barometer. Despite expressing uncertainty regarding the future of NAFTA, U.S. producers remain optimistic that U.S. agricultural exports will either hold steady or increase over the next five years. Finally, over two-thirds of producers responding to the February survey expect soybeans to be more profitable in 2018 than corn. Despite that, only 10 percent of producers said they plan to increase their soybean acreage compared to last year. If you have trouble accessing this page because of a disability, please contact Ag Economy Barometer at ageconomybarometer@purdue.edu.